Courtesy of the artist. Pierson's "Vortex above the Forest." Photo by K. Wheeler Pierson in his Old Town studio. Billowing clouds promise something powerful as a storm seems to erupt from the sky. The darkness opens through a quiet grey day like an inverted mountaintop. An eye of light recedes from the center as you watch, and evergreen treetops in the foreground relate the scene to earth. 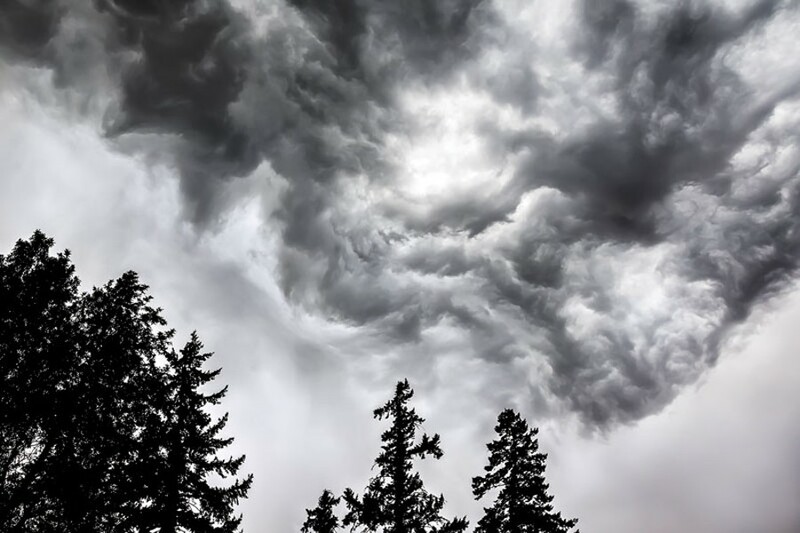 The photograph, "Vortex above the Forest," is large enough to take you into the weather front. Water, light and air in the natural world are prime in all of William Pierson's photography, which is on display at Piante Gallery this month in a show titled Soul Searching for the Inner Eye. There is a sense of moving weather and timing that connects the viewer with the awe of nature in her various moods. "They are more photographs of emotions and events than objects themselves," says Pierson. He doesn't go out with a predetermined idea of what he'll be photographing. "I just go where I go and I have a camera with me. But it's not on my shoulder, it's in the car somewhere. And then if I see something I go get it." His subject matter is the landscape of his everyday path, out in the elements, under the sky. Each shot is a synchronistic happenstance — he is in the right place at the right time and sees his next inspiration. Pierson chuckles, saying, "It takes a lot of looking." He snaps as many shots as he can while the event lasts. "You never know which one is going to capture it best." 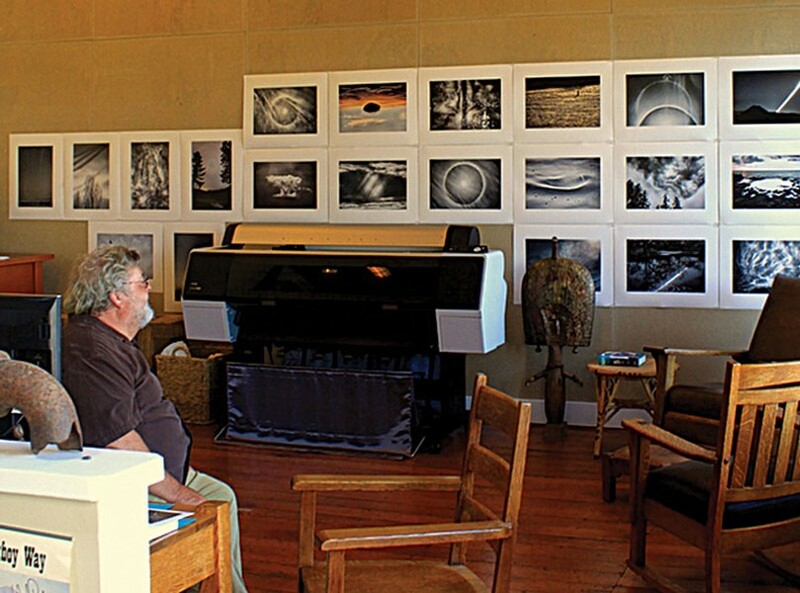 In his more than 40 years of working in the photographic medium, Pierson has done a lot of one-man shows. Each show is a timeline, the pieces culled from the year; now he goes two years between shows. Editing is hardest for him. Each photograph must "get along" with the rest, thus the whole show becomes its own entity. "Ultimately art is a manifestation of the artist themselves, and we continue to evolve and change and so does the art." There is a red door in a slight recess off the sidewalk in Eureka's Old Town. Once inside the door, a narrow staircase presents itself. At the top, to the right, the hall ends at Pierson's studio door. A Jim McVicker painting invites you in with greys, blues and greens. There is a little kitchen nook just to the left, but the whole west wall is framing beautiful, tall, old windows. The wood floor and wood furniture are heavy and warm. The loft ceiling boasts dark timber beams and there is at least 3 feet of brick above the finished walls. "Traditionally, the nicest light is in the morning or evening. My favorite, ultimately, is anything that is backlit. Because the light comes around the object." The sun is shining mid-day and all you have to do is stand back from those windows and the whole room offers backlighting. The proofs for Pierson's show are in rows, edge to edge, all along the south wall. They surround the huge Epsom printer as part of the ensemble. Everything has a place in here, just so. Pierson moves a photograph of Morris Graves from a chair so I can sit down. "He was a friend of mine. He sits there with me." He laughs wistfully, adding, "Most magic person I have ever known. He trusted himself and did what he thought he should do." Pierson trusts himself, too. "I was always interested in art, always visually oriented. I can remember my first art piece in kindergarten. I still have the piece. It was a classic thing, we were making a candy dish for our moms for Easter." Pierson used a block to form his simple, clean dish. "Then the teacher came around and said you have to do more than that, and I said, 'No, it's done.'" Most artists begin with an inspiration, an artist admired, the pleasure of another's appreciation. "Eventually," Pierson says, "you realize that the only one that counts is yourself." In one photo, light casts through mist on the water. An egret heads across the water, only a couple of inches deep, rippling and quiet. There are subtle color variations in all the white, black and blue. There are shadows and reflections moving around its legs, contrasting the bird's crisp, white form. "I had been sitting on this dock for a long time, watching the tide come in. And then the egret landed and started walking across. I don't do wildlife photography, but every now and then, wildlife sneaks in." Soul Searching, For the Inner Eye opens during Arts Alive! on Saturday, April 4 and continues through May 16 at Piante Gallery, 620 Second St. in Eureka.